Every year around the holiday season, I treat myself to one present that I have been lusting after for most of the year! This year, as I mentioned in my post yesterday, I treated myself to something that excites me – far more than it rightly should. Something I have wanted for a long time. After seeing so many pictures and videos of all different spiralised salads, fruits and veggies I decided it was my time to get in on all of the spiralising action. I got the Lurch Spirali spiraliser and I am so happy with it. Last night me and my friend had a little play on it. Then when I got home I spiralised some pears. Wow. OMG. 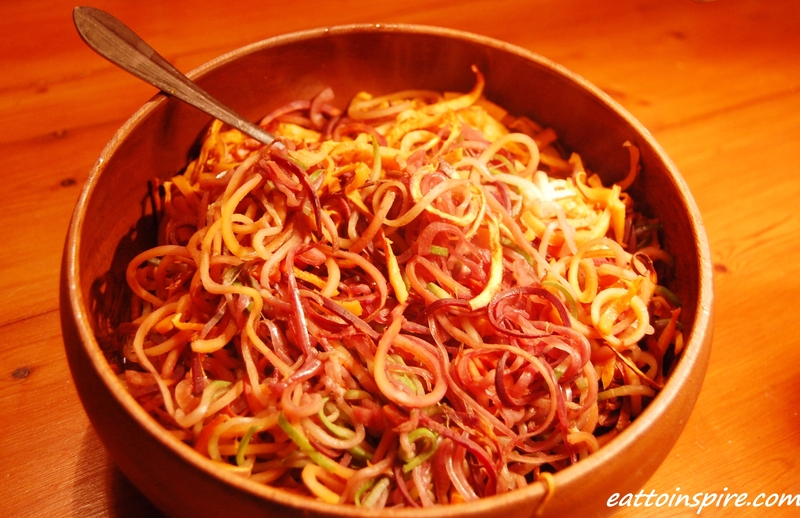 Pear noodles. They were like a delicious healthy version of the strawberry laces that I was way too fond of as a child. Tonight, for my evening meal I made this awesome concoction. Firstly, I spiralised a large sweet potato and then I baked this on an oven sheet with a wee bit of oil. Then I got my wok out, and I fried a little garlic and ginger before I tossed in spiralised onion, rainbow carrots and courgette. When all of my veggies were cooked I tossed them all together in my gigantic bowl and added a tiny bit of soy sauce. Wowee. 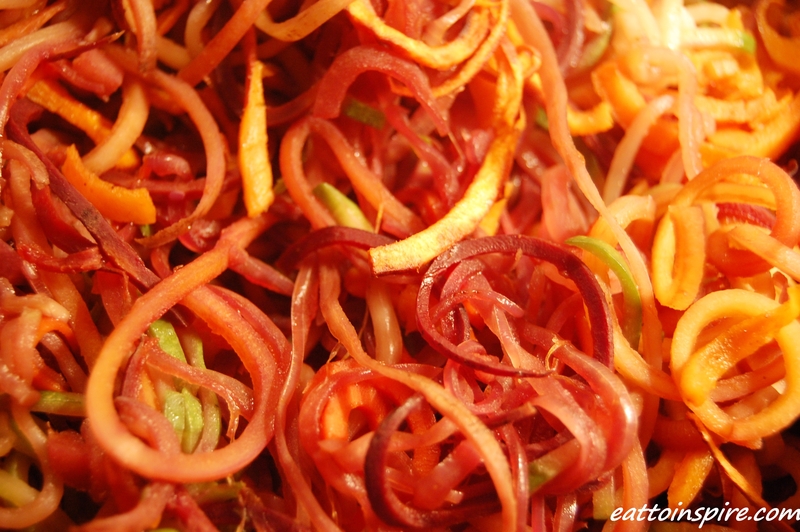 You can expect to see a lot of posts featuring spiralised delights from now on! What is your favourite kitchen gadget? I want this gadget! I have always followed this blog http://www.inspiralized.com/ and she has some amazing recipe all focused around those fun veggie noodles. I love kitchen gadgets and a spiralizer is on my list to buy. I have a julienne potato peeler kind of thing that I like. My favourite gadget are my juicer, food processor and dehydrator. Rapidly running out of kitchen space!